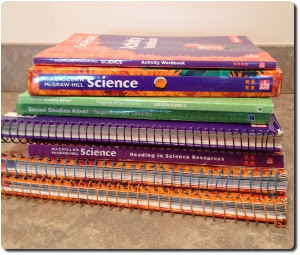 Unexpected Homeschool: So, Now Where Do All The Pretty Books Go? So, Now Where Do All The Pretty Books Go? Amber is finishing up three subjects this week: Reading, Spelling & Language Arts. She has already finished the Science curriculum and we've been doing Health for the 4th Quarter. The rest of the subjects she will finish within another 2 weeks. As I was tidying up my teacher's manuals today the thought came to me. What in the world do I do with all these books? All of the lovely books that we were so excited to receive in the mail just a short few months ago, I'm now wondering how to dispose of them. 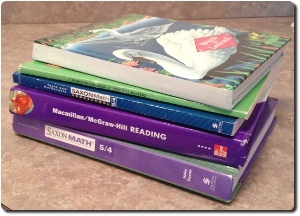 Not only do we have everything that we've used for 4th grade, but we will also have the complete set of Saxon Math 6/5 by the end of July. Amber definitely is going to skip Math 6/5 and go into 7/6 for 5th grade. We've been testing through it and we haven't marked in a single book. It seems like a waste to have the whole set and never use anything but copies of the tests. If this was a one time issue, I'd throw them in the donate box for the next charity that calls, or the "maybe I'll have a garage sale this year" stack. However, we are going to homeschool for another four years. I need a real plan for disposal of these books that are going to accumulate each year. I have a very low tolerance for clutter in my house. To be honest, I'm fairly OCD about it. You know those neat / clean freak people that everyone knows exists, but they are thankful they aren't one? I am one of them. We have an unfinished basement, on purpose, so that the "junk" can find an organized home out of my way. But the basement is only for "junk" that makes the cut. It needs to possibly have a use again someday. It's sad that the school books we loved (and some we disliked) have so easily become "old" and "in the way". But it is the truth. They are going to be in the way when the new curricula arrive and my promised shelving has not yet been built. I do hear about wonderful homeschool used curriculum sales. I just don't hear about them in my area. We aren't part of a co-op or any other homeschooling group where I can see if the books will be useful to another homeschooling family. That leaves me wondering, is there a useful way to make these leave my house - without costing me money? Actually, earning me money would be even better, but not required. I've considered selling them on Amazon, where I got some of them. It is so hit or miss though, and I'm not guaranteed anything will sell or within a decent time frame. There really has to be a good way to make these leave my home. Seconding Homschoolclassifieds. You might also want to post them for sale on the Well-Trained Mind boards....it moves very quickly. eBay? It's sometimes a challenge to sell there, but it seems like books such as Saxon, Apologia, Alpha Omega, etc do very well. Does your library or grocery store have a corkboard for people looking for work or selling things? You could place an "ad" there by creating a poster with the list of items. Or does your library have a homeschool section? You can donate towards that so other homeschoolers can benefit from borrowed curriculum. Or ask about starting on at the library! Having those books available can be a very blessed thing for some homeschoolers! Good ideas too. I used to sell on eBay and got so frustrated with all the seller changes that I quit. I buy stuff once in a while, but rarely. I like the idea of the library. I'm not sure they do have a homeschool section. We mostly borrow e-books from the library and rarely go there. I do know that our county library re-sells all donated books at a yearly fundraiser. They don't put them into circulation. Still, the books at the resale are cheap, and I'm sure lots of other homeschoolers go to it. It's May 30 this year. I think the cut off for sign up is later this week, not sure.